The 3D Printing Association (3DPA) is currently running a stakeholder survey to better understand the drivers and challenges for the 3D printing industry. This 10 minute survey can be found here. The 3DP-RDM Scoping Workshop of 30th January 2015 featured two distinct discussion activities. The entire process is described in the presentation slides from the day and the output of the first discussion activity is provided here. 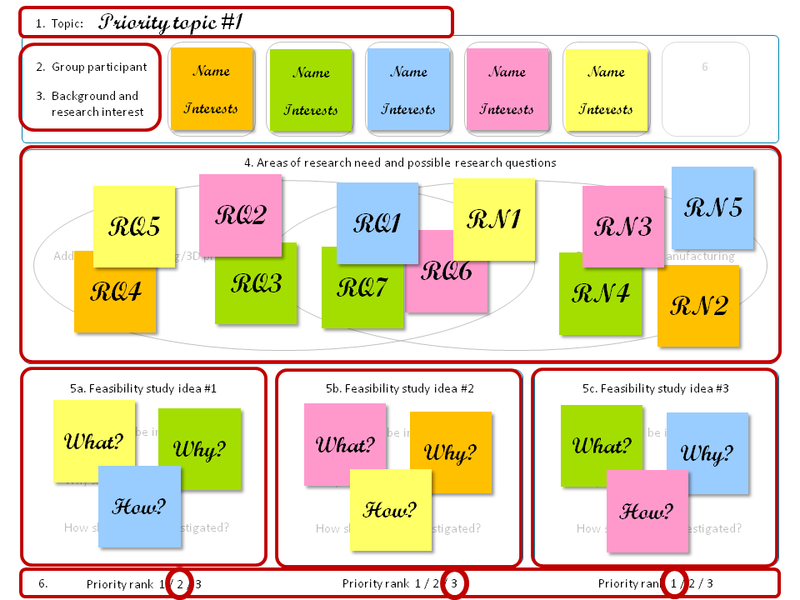 This post summarises the process and outputs of the second discussion activity, which involved structured discussions around the selected priority research topics, and identification and development of concepts for potential feasibility studies. Following the outputs of the prioritisation process, participants were invited to join in groups of 4-5 people to explore one of the prioritised topics. This resulted in the creation of the eight groups listed below. As one of the topics “How will value be created and captured in 3DP-RDM economy?” was so popular, it was determined that two groups would explore this in parallel. 3 Reconfiguring supply chain: will consumers become prosumers? 5 How will value be created and captured in 3DP-RDM economy? 6 Who owns/shares designs in 3DP-RDM hubs? 7 How will value be created and captured in 3DP-RDM economy? Once the groups were determined, each began to complete the template shown below. Through following the steps in this template, members of the group first got to know each other better and to understand each others’ research experience and interest, before beginning to explore what research could be conducted within the chosen topic. Having generated some ideas about possible research needs or research questions, each group then chose three to explore in greater depth, considering how these could be addressed though feasibility studies. A final step in the process was to decide which of these three feasibility studies was most important, with them being ranked 1, 2 and 3 in decreasing order of importance. The raw data generated from each of these discussions is presented below. 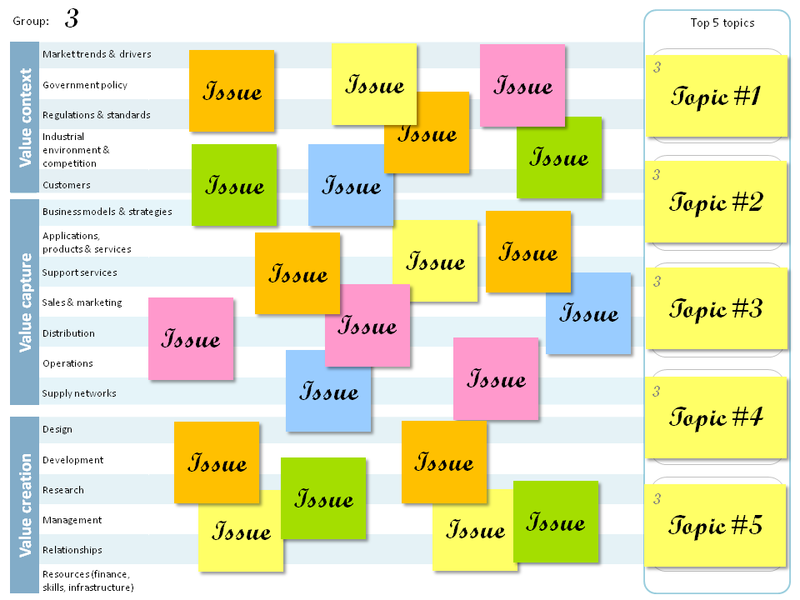 Using the template is a stimulus for discussion and only some of this discussion is captured on the Post-it notes. As such this data should not be considered as a complete picture of each group’s discussions but gives a flavour of what was discussed. What should be investigated? Analyse existing feedstock supply chain: who, where, how, why? Group 3: Reconfiguring supply chain: will consumers become prosumers? What are the characteristics of SC for: consumer, prosumer, professional? Business models; Do consumers monetise designs? Why would you do it? Data ownership if consumer creates? Is QA needed in prosumer medical? Why should it be investigated? No one has done this! What should be investigated? How do people interact with new CAD tools allowing volume modelling? How do these tools interact with the design world? What should be investigated? Is it possible to address the gap between manufacturing and design processes? How should it be investigated? Comparative studies of various existing/new technologies. Case study: different situation in maker design, what effects will come given new technologies. Group 5: How will value be created and captured in 3DP-RDM economy? CYCLE: Process → Material or component → Product → Material of component → etc. Why should it be investigated? Proximity, context, time. Durable or consumable product? Why should it be investigated? (1) End-user co-create: their choice/design, on demand. (2) More knowledge of material sourcing: warranty & authenticity. (3) Brand: direct relationship engagement with customers, parts/products. (4) Proprietary materials/parts: marketing value. Group 6: Who owns/shares designs in 3DP-RDM hubs? Does there need to be a new IP right? What business models complement IP? It should be an opportunity, not a barrier. Group 7: How will value be created and captured in 3DP-RDM economy? How could a multi-purpose machine lead to a variety of business models? What should be investigated? Parts manufactured locally. How would we configure a supply chain which makes the business model work? How can local economies/geographies take advantage of the 3DP tech? What should be investigated? Analysis of the economics of 3DP vs subtractive. Where is the threshold now? Where was it 10 years ago? How did it move? Why? What will 3D printing be worth? How public policy could influence BM? How setting targets influence BM development? What new products & business skills will AM enable? What BM will these require? What should be investigated? How do new 3D-tech enables new BM that are based on a reconfiguration of the supply chain? This workshop and its reporting could not have been possible without the work of many others. Special thanks go to Jo Griffiths for supporting the organisation of the event, to Samantha Selvini and Dominik Deradjat for photo and video documenting the workshop, and to Dr Mélanie Despeisse for assisting in the production of this report. 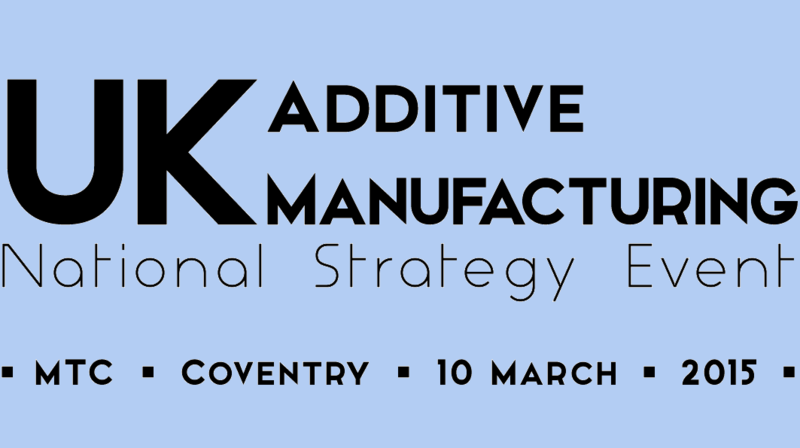 Would you like to influence the scope and shape of the UK Additive Manufacturing Strategy? Representatives are needed from industrial sectors and supporting organisations to highlight their use of AM/3D Printing now, what their future use will be and what the barriers currently are. If you require additional information, please contact Donna Cope at donna@am-conference.com. The 3DP-RDM Scoping Workshop of 30th January 2015 featured two distinct discussion activities. The entire process is described in the presentation slides from the day. This post summarises the process and outputs of the first discussion activity, which concerned the identification of priority research topics. On arrival at the workshop, participants were assigned to tables to create multi-disciplinary groups of 5-6. For the first discussion activity the seven groups created were given the task of answering the question: “What are the research issues at the intersection of 3D printing and re-distributed manufacturing?” They were given pens, Post-it notes and the template shown in the figure below to structure the discussion. Towards the end of their discussions, the groups were instructed to identify the top five topics that they thought needed to be investigated. The groups then described these topics to the other groups as the Post-it notes detailing these were placed onto a larger ‘landscape’ map that everyone could see. Where possible, similar topics were clustered together on the map. Then with each group having identified their top five topics, these Post-its were placed onto the map until all 35 were posted. The final stage in the identification of priority research topics was to allow participants to vote for those topics they considered most necessary to be investigated through feasibility studies during this first year of the network. Each participant was given five dot stickers that they could place on five different topics on the landscape map. The following table summarises the list of 35 research topics that groups identified and the number of votes that each received during the prioritisation. Some of the topics were clustered prior to voting and the six clusters are also numbered. Standards + compatibility + regulation + certification // avoidance + convergence? How will value be created and captured in the 3DP-RDM economy? Reconfiguring supply chain: consumers becoming prosumers, ownership? Software requirements and infrastructure in redistributed environment. How is it accessed? Material supply chain – how structured and delivered? “Facebook problem” Who owns/shares design in re-distributed 3DP hubs? Trade off between localised and centralised? When? Why? Where? Do we need a new IP regime to enable 3DP and distributed manufacturing? How do you define and construct a user-friendly interface design? Waste, obsolescence management: what are environmental gains (if any)? What hinders/barriers to enable 3D printing to redistributed manufacturing? What are requirements of regulators? What related standards required? How will patent/public be engaged in design of management risk? Re-engineering value chain -> where is the value? E.g. Where is stock kept? At home? At local hub? At retail? When is RDM worthwhile and where is 3DP worthwhile for RDM?